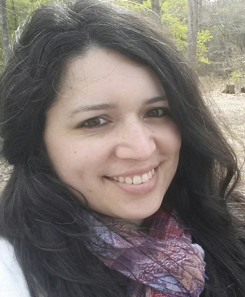 In this edition, we hear from María Fernanda Garcia, a dual-language English/Spanish teacher at MacFarland Middle School (DCPS) in the Petworth neighborhood. In late summer of 2016, I was offered the career-changing opportunity to attend WISSIT by Julian Hipkins, the Global Studies Coordinator at Roosevelt High School. Even though I had already been teaching for about 11 years, WISSIT was my first time experiencing professional development that wasn’t centered on adopting instructional practices and curriculum that were mandated by a school district. Instead, it was professional development focused on helping me discover new ways of thinking about my practice, my students, and our place in the world. At WISSIT, I was able to generate rich ideas and understandings through my experiences as a learner in a wide variety of high quality workshops where I was treated as a capable and creative professional. 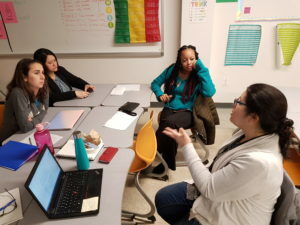 After WISSIT, I was able to participate The World in DC project cohort (a collaboration with DCPS, Project Zero’s Veronica Boix Mansilla, and the PD Collaborative), where I developed curriculum based on the global competence framework and Project Zero Global Thinking Routines (GTRs). I felt incredibly empowered by this work to bring my own vision and purpose as an educator to the forefront of my teaching, which resulted in huge impacts on the learning of my students. Since then, I have actively sought out opportunities to continue my participation in WISSIT, Project Zero, and DC-PZ . This year, I was lucky enough to be able to join the Making Across the Curriculum cohort of teachers. Our collaborative professional learning was focused on the work done by the Project Zero Agency by Design team through their book,Maker-Centered Learning (2016). 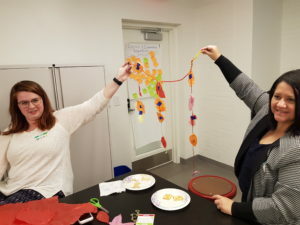 Together, with a large group of peers spanning PreK-12th grade from public, charter, and independent schools in Washington, DC, we were able to actively engage in making around a variety of content areas during three whole-group evening seminars and four smaller collaborative group sessions. The facilitators of the seminars, Edward Clapp and Sarah Sheya, crafted making experiences that fostered creative, critical, reflective, and intellectually provocative collaboration with my peers. These experiences fueled my courage, and, after only the first seminar, I was ready for my students to tackle making! The fact that I teach language arts in Spanish to 8th graders in a Title I public school, without a dedicated maker space and very little in terms of raw materials, was no deterrent. My goal was for students to formulate a central idea around an abstract concept related to US imperialism in Latin America during the 1930s-1960s. This was in response to reading about the Cuban Revolution as a reaction to the colonization of Latin America by European countries. Our anchor texts for this work wereThe Open Veins of Latin America by Eduardo Galeano and Che: A Revolutionary Life by Jon Lee Anderson. Both were quite dense and introduced many new concepts, and I was looking for a way for students to synthesize what they had learned. Through Making Across the Curriculum, I was able to land on the idea of creating sculptures that represented one of the concepts studied in relation to a particular person or event from the anchor texts. 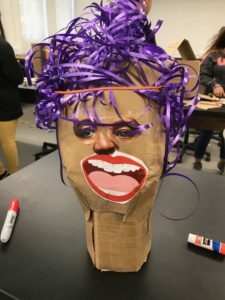 Students partnered with each other, selected their concepts, and used cut-up magazines, cardboard, string, tape, and paper clips to create a sculpture that was able to capture the meaning of the concept in relation to the event/person. The end products ranged from very abstract and hard to interpret to very clear representations of the concepts. Even now, a few months later, mental snapshots from the students’ two-week making process sticks in my mind. 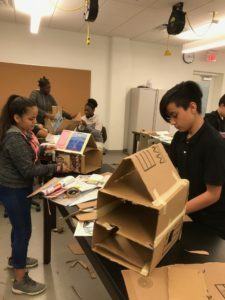 One student, Cristofer, who is an English Learner (EL) and who struggles with reading and writing even in Spanish, expertly fashioned cardboard hinges to connect moving facial masks to represent the oppression of the poor and landless. 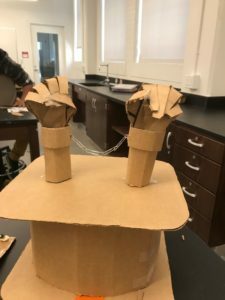 Keyla and Anaya, two students who struggle with the school’s behavior expectations, spent hours patiently constructing detailed handcuffs that they mounted on a stake to represent the injustice of poverty. Eddie and Tyreek, students continuously on the verge of failing their classes, created a bust of Che Guevara, hero of the Cuban Revolution who demonstrated great solidarity with the marginalized people of Latin America even though he himself was born white and wealthy in a country far removed from the island. Fredis and Mariana struggled to represent the “imperialism Yankee” described by Che Guevara in his speech to the United Nations in 1964 until they settled on a red, white, and blue rocket on a base covered in images of the war and destruction that often accompanies a revolution. This foray into making was, in one word, emotional. The students were thrilled and inspired by this opportunity to create. They spontaneously volunteered positive feedback on the experience in every lesson. They expressed pride and interest in their work. They scrunched up their faces in concentration as they came up with various solutions to the obstacles that arose during the construction phase. On my end, I was taken aback with how much they liked it, and I felt sheepish at not having figured this out on my own after 13 years of teaching! Upon reflection, I realized that this has more to do with having my professional creativity obstructed by feeling pressure to follow a curriculum designed by someone else. After trying this out, I now feel a great sense of self-efficacy when it comes to being able to make modifications to the curriculum in creative ways that authentically raise student engagement and academic rigor.